The Sanctuary of Truth Pattaya, is one of the city’s most visited cultural attractions. 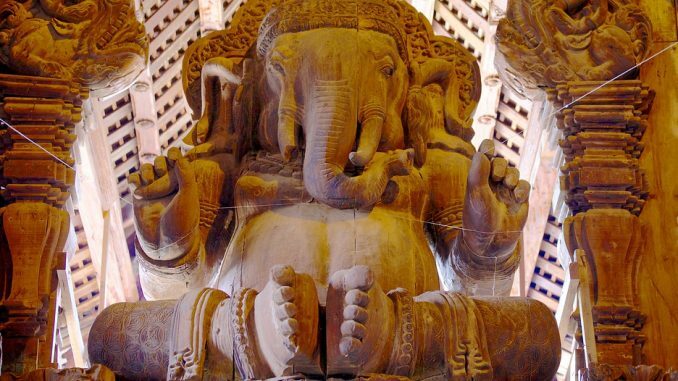 This 105 meter tall wooden mammoth is the vision of one man, Lek Viriyaphant. Khun Lek is a rather eccentric Thai billionaire who sadly passed away in 2000, and will regrettably never get to see his vision completed. The vision behind the temple was conceived on ancient eastern philosophy, architecture and beliefs. Lek’s vision was to create a symbol of the East which would sit with pride among the many western style buildings that now adorn the Pattaya skyline. It’s was his wish to have the Sanctuary of the truth built to ancient methods that has resulted in the building taking so long to complete. 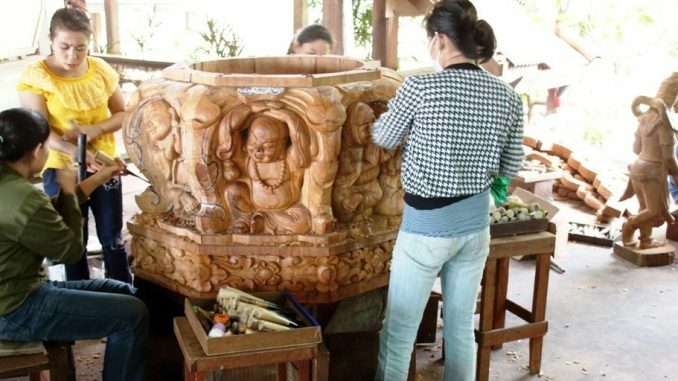 After years of research, study and design Lek and his team finally began construction on the temple in 1981, and since then a team of 250 highly skilled craftsmen have painstakingly created this labor of love. 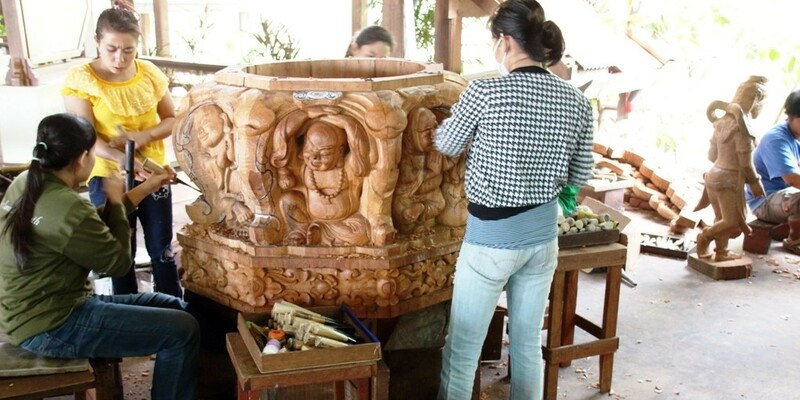 Every single square inch of the Sanctuary has been hand carved using ancient methods and tooling. Work will continue on the site until it’s planned completion in 2020, however many experts believe work will continue well beyond this date. The main temple chamber is a huge space, the peak of which is some 105 meters tall. The 4 adjoining wings each present a different take on Thai culture and beliefs. Thai, Khymer, Hindu and Chinese. Although the Sanctuary of truth is often referred to as a temple (yes we are also guilty) it does not align itself to just one belief. In fact this is part of Lek’s original vision to create a space for everyone as equals. As well as the main building being one of such majestic beauty, it’s location is also quite sublime. Sitting a top its very own peninsular in Naklua to the north of Pattaya, the building is in the perfect spot. From here it’s distinctive silhouette is easy recognizable against the more modern backdrop of the Pattaya skyline. Even though the Sanctuary of Truth Pattaya is still very much a work in progress visitors are more than welcome. And in fact the revenue generated by those tourists is what is keeping the project going. 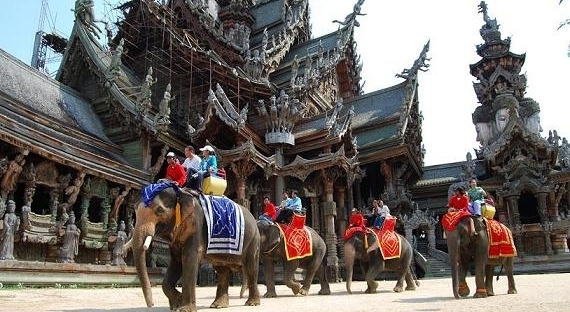 For a modest fee of 500thb, visitors can spend as long or a little as they wish wandering the grounds and temple. The entrance fee allows you access to the whole grounds, which in themselves make for a truly stunning experience. Visitors are invited to take one the guided tours which start every 30 mins and are available in English, as well as Chinese and Russian. The guided tours are conducted with small groups of around 10-15 people. We highly recommend you take them up on this offer. The guides are extremely knowledgeable and have a passion for their jobs which is infectious. After the tour you are course free to explore at your own pace and enjoy a more leisurely experience. As well the temple, guests can also enjoy the Thai cultural show, an Elephant ride around the grounds or even a speedboat ride out into the bay to enjoy the vista as Lek originally intended. Of course these are extras and are not included in the cost of your ticket. The Sanctuary of Truth Pattaya is located at the end of Soi 12 and although this can be reched by Baht bus this would involve a walk of around 2omins. Take a taxi it should only cost 200thb from any central Pattaya hotel. Overall this is one of our must see attractions here in Pattaya, if you like to experience different cultures and learn about different religions then the simply have to visit the Sanctuary of Truth. Please be respectful and wear modest clothing, ladies that means cover down to your knees, and gents full length trouser and sleeved shirts. This is an outside attraction so be mindful of the heat and make sure you have plenty of fluids with you. Oh and don’t forget your camera.